Spring is an ideal time for planting in almost all areas, as warming temperatures and regular rainfall makes conditions ideal for plant establishment, never plant any flowers or grass seed until you are sure winter is over. When planting shrubs or trees always remember the saying, plant them high and they won’t die, Plant them low and they won’t grow. Never mulch to high around trees, this will cause the trunk to rot. In most parts of the country, summer means watering. 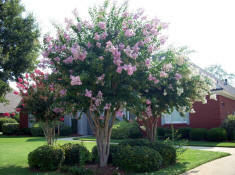 To provide your lawn with the correct amount of water, figure out the specific needs for your lawn, trees, and shrubs. You want to avoid drought stress, but over watering is bad to, which can be as detrimental as drought. And remember, this is the time of the season for insects to create their homes in your lawn and bugs to eat your trees & shrubs. Take the appropriate steps to prevent this. Summer is also the worst time for your lawn; annual grasses like crabgrass & nuts edge grass thrive this time of the year, while your good grasses get weaker.